Because of the number of powerful, proven ingredients in my ultimate "superfood" formula, this report contains references to over 80 scientific studies. It could easily have contained five times that many. I spent almost 15 years, developing and playing with it. It was originally designed for my personal use--for myself and my wife Kristen. As I explained when I first created it, I never intended to sell it to the public since the formula I had in mind was too expensive. The idea was to develop a product that would serve as the cornerstone of my own health and nutrition program. However, three things changed. Thanks to the creation of Baseline Nutritionals, I have an outlet for this formula that sells direct to the public so that I can offer the formula at a price much closer to its actual cost, which means it can be affordable for anyone -- anyone, that is, who wants the best that money can buy. Thanks to my work with Baseline Nutritionals, I have manufacturers and ingredient suppliers in place that I work closely with and to whom I provide significant amounts of business each month--who are, therefore, more than happy to grant me price concessions even on smaller runs of the product. This helps keep the price down on such a "specialized" superfood formula. Taste has never been that big a deal to me when it comes to health and nutrition. (Anyone who has tasted my blood cleansing formula can tell you how true that is.) If something works and provides the health benefits I'm looking for, I don't really care what it tastes like. For me, personally, taste is a secondary issue. But in the real world, most people don't feel the same way. In the real world, taste and smell matter. The problem is that when you mix a number of superfood ingredients together, their tastes don't necessarily mix (think pickles and chocolate ice cream). Fortunately, after years of developing and tweaking this formula, I've actually got it so that it tastes great, mixes beautifully, and has a rich color -- all with no concessions to the actual efficacy of the final formula. If you search under "superfood" on the internet, you will come up with many "hits." Some sites will tell you that superfoods are replacements for multivitamin pills. That's not what I was after. I wasn't looking for something to replace a daily multivitamin. The simple fact is that most people who are interested in alternative health already take some form of daily multivitamin. So the idea that you need to pack your superfood with vitamin isolates so that it has mega doses of every vitamin and mineral under the sun is, essentially, a meaningless exercise. And as for those formulas that try and do it without pumping their formula up with isolates and just use natural ingredients, the numbers simply aren't there. It's virtually impossible to get the numbers of many vitamins (such as vitamin C) and minerals (such as calcium) up to "significant" levels without using some isolates. But the bottom line on this issue is: why duplicate a vitamin pill? Some sites tell you that a product consisting entirely of one ingredient such as bee pollen or spirulina or soluble rice bran or Tahitian noni are superfoods. The problem is that no matter how great one ingredient is, it can't possibly give you everything you need. It may have some of everything like bee pollen and spirulina, but there are key phytochemicals that are only found at meaningful levels in certain types of food. For example, spirulina is a great source of chlorophyll, but it contains almost no ellagitannins. For those, you have to turn to berries or pomegranates. Single ingredients may be "super ingredients," but by themselves they do not qualify as "superfoods." In the end, if you want a true superfood, you have to blend ingredients. Some sites will tell you that everything you need is contained in green foods and a few vegetables--so all you need to do is blend those and you'll get what you need. Not true. Again, no ellagitannins. No DHA and EPA omega-3 fatty acids. No monosaccharides and polysaccharides. The bottom line is that you have no choice; if you want a real superfood, you must blend your formula across "families" of ingredients. So exactly what was I trying to create? What is it that I was trying to accomplish with his superfood? Well first of all, I avoided the two things most formulators do and that were mentioned above. I absolutely wanted the formula to have a good complement of naturally occurring vitamins and minerals, but I wasn't worried about the 100% of all your daily needs thing. My intention was that this superfood formula be only one of several meals you eat during the day, and I assumed that you would continue to take whatever multivitamin you were already taking. That would allow me to focus on the things that were more important to me -- and that aren't being provided by other meals or supplements. And second, I wanted the formula to contain enough protein so that you could truly live on it. But I wasn't designing a protein supplement for bodybuilders or seniors (I ended up designing that later), and I didn't want people to suffer from severe gas or allergies so I wanted the protein to be as hypoallergenic as possible. In addition, I also wanted the superfood to provide significant soluble and insoluble fiber to help keep your intestinal tract clean and reduce blood pressure and the incidence of heart disease and colon cancer. I knew that omega-3 fatty acids were essential. As I've explained in Lessons from the Miracle Doctors and many newsletters, I consider the high consumption of plastic fats and the imbalance in the diet of omega-6 to omega-3 fatty acids to be the single biggest causative factor in most of the ill health we are now seeing in the industrialized world. It was imperative that this formula help correct that imbalance. As for carbohydrates, they are essential for good health, and yet short chain carbs and sugars probably qualify as the second biggest causative factor of ill health. On the other hand, ultra-long chain carbohydrates (ULCs) may be one of the single best foods you can consume to optimize your health and provide sustained energy throughout the day. The formula had to contain a significant amount of ULCs. And then there are the phytochemicals. To me, this was the most important aspect of his formula--its raison d'être. All of the things mentioned above are merely the base of the formula, the infrastructure on which its true value is built. It's the individual miracle phytochemicals, antioxidants, and enzymes that most people don't get at all in their diets -- or at most get one or two a day. The purpose of my superfood formula is to work as an optimized carrier for meaningful doses of the most powerful healing phytochemicals we know today. We're talking about ellagitannins, mucopolysaccharides, xeronine, and xanthones, acemannan, and astaxanthin for starters. Quite literally, we're talking about several hundred specialized antioxidants inherent in the high powered ingredients themselves. It is in these phytochemicals that provide the primary value of this formula. And it was imperative to me that every one of these ingredients be included in "true" amounts -- no pixie dust allowed. There is a phrase used in the formulation trade, "pixie dust," that refers to the practice of using such tiny amounts of an ingredient in a formula that the ingredient adds nothing to the value of the formula other than the fact that you can list it on the label. You see evidence of this when you look at a label and see vegetable or fruit powders added at 5 and 10 mg each. What possible value is there in 5 or 10 thousandths of a gram of dried broccoli? Or you'll see CoQ10 at 10 mg, when it takes 100 mg to make a difference. The bottom line is that I've never used, and never will use, pixie dust in any formula that carries my name on the label. Do it once and all your credibility is gone. Also, as I've has stated over the years, all formulas that carry my name are initially designed primarily for my own personal use, and for Kristen. Pixie dust makes no sense. That's why I proudly list the precise amount of every ingredient in this formula. And let's talk briefly about ingredient sourcing. Over the years, I've developed some of the greatest raw, organic, and wild crafted ingredient sources in the world. This, as much as anything, accounts for the reputation my formulas have and why knockoffs always come up short. But when designing the superfood formula, there were requirements above and beyond just basic quality. I had to deal with issues such as taste and shelf life. To get exactly what I needed, I had to hunt down what, in some cases, was the only source in the world of the exact ingredient I needed. And that search has never ended. I still keep looking for higher quality versions of the ingredients--anything to make the formula ever better. And that's why over the last 10 years you might have noticed little tweaks to the ingredients on the label. As mentioned above, what made it all come together is that I was finally able to get a formula that not only provided all of the health benefits I was looking for, but also offered great taste, smell, color, texture, and mixability -- and that was easily digested. A rare combination that took 15 years to achieve. This formula has now been available for just over a decade and is generally regarded as the best formula of its kind in the world. It's not inexpensive, but as is true with most of life, you get what you pay for. Let's now take a detailed look at every ingredient in the formula. Flaxseed contains approximately 28% soluble and insoluble dietary fiber, with about 30-40% of the total being soluble. Research has shown that fiber lowers cholesterol, modulates glucose, improves gastro-intestinal function, and reduces the risk of colon cancer. Sufficient fiber in the diet is vital to good health. The average American only consumes about 8.75 grams of fiber per day, but to prevent colon and breast cancer and aid in the prevention of heart disease, you need between 25-30 grams of fiber a day. And finally, since flaxseed contains all of the essential amino acids, it is a good source of complete protein. Brown rice protein is an excellent source of vegan, hypo-allergenic protein (unlike dairy, egg, and soy proteins). In addition, brown rice is a complete protein, with one of the highest Protein Efficiency Ratios known--virtually matching whey, even for bodybuilders.10 The Protein Efficiency Ratio (PER) is the measure of protein available for the body to use. The PER is connected to the percentage of the protein in a food that is actually digested by the body. With rice protein, after 4 hours, better than 80% of the protein has been digested, compared to only about 57% for soy. The problem with rice protein, however, is that even though its taste is mild, it can tend to add a chalky consistency to anything it is added to. For that reason we blended it with Yellow Pea Protein. Pea protein is the perfect complement to rice protein for several reasons. First, it offers an improved amino acid profile. Like rice protein, it contains all nine essential amino acids, but is especially high in lysine, the amino acid that rice protein is most deficient in. The bottom line is that when used in combination, rice protein and yellow pea protein offer a superior Protein Efficiency Ratio that rivals dairy and egg -- but without their potential to promote allergic reactions. In addition, the texture of pea protein helps smooth out the "chalkiness" of rice protein. Bamboo fiber represents a "new" type of dietary fiber derived from the fiber-rich parts of bamboo plants. It consists of more than 90% water insoluble fiber that cannot be broken down by the human body, so it bulks in the stomach, removes undesired metabolic by-products and shortens intestinal transit time. It also provides a wonderful, almost milk-like, consistency to the formula. Hypoallergenic protein with all nine essential amino acids. Rich in B complex vitamins. Minerals (including high amounts of potassium, magnesium and manganese) and trace minerals. Polyphenols, phytosterols, and sterolins (high quantities of Beta-sitosterol and Beta-sitosterolin). Mixed carotenoids, including lutein and zeaxanthin. Lecithin (phosphatidyl choline, phosphatidyl serine). A company in Sweden, Nutritech International AB, figured out a way to use low-temperature steam (produced in a partial vacuum) to take barley seeds just up to the point of sprouting -- before they turn gelatinous, but after the point where all the proteins and carbohydrates have been converted, and at a temperature low enough so that no enzymes are damaged. This turns out to be a remarkably interesting point for food. It's like the food is placed in a state of suspended animation at the point where all of the energy of the grain has been marshaled to sprout the seed -- and not yet expended in the act of sprouting. The result is a brand new superfood, called Activated Barley (or aktivated barley in Europe), with unbelievable properties. Like regular barley, activated barley ranks incredibly low on the glycemic index. It has a rating of 25 on the glycemic index scale and is classified as a low GI food. It does even better on the glycemic load scale with a rating of 11 for one cup of barley. It has all of the nutritional value of barley -- high levels of tocotrienols and beta glucans. In fact, pre-sprouting increases beta glucan levels by some 94% according to tests performed by AnalyCen in Sweden. It provides over 400% more energy per calorie than any other food calorie known. (Despite what the FDA may tell you, not all calories are created equal.) As it turns out, there are two different ways to test for caloric value. The traditional way is by burning the product to determine the energy released. This is the FDA approved standard. However, a more meaningful test is to measure the metabolic calorie value -- that is: how much energy the BODY can use or produce from the food in question. For Activated Barley, the metabolic calorie value is 400% higher than a standard calorie such as fat. In addition to being a great source of protein and all round nutrition, chlorella also has some very specialized benefits. Chlorella is alkaline and helps balance your body's pH. It is not an accident that carotenoids and carrots share the same root name. Carrot juice powder contains over 400 known carotenoids, in addition to offering one of the highest sources of true beta-carotene. And, of course, it adds a wonderful sweet taste to the final mix. In the past few years, studies of pomegranates have shown components that inhibit skin cancer, breast cancer, high blood pressure, and atherosclerosis. Pomegranate juice is an antioxidant powerhouse, packed with both the polyphenols that have made red wine and green tea famous and the ellagitannins that have made red raspberries one of the hottest food items in the anti-cancer arsenal. According to an article in the Journal of Clinical Nutrition, people who drink just 2 ounces of pomegranate juice a day for a week increase antioxidant activity by some 9 percent. Supplementation with pomegranate extract makes sense if you are looking at cancer prevention,35 maintaining heart health,36 reducing bad cholesterol,37 lowering blood pressure,38 and protecting against free radicals and aging. Wheatgrass has been called one of nature's finest medicines. It contains chlorophyll, enzymes, vitamins and nutrients that are essential for optimal health. The benefits of wheatgrass are enormous. These include correcting blood sugar imbalances, purifying the blood, enhancing hemoglobin production, neutralizing toxins, purifying the liver, and removing heavy metals from the body. Ultimately, though, the primary benefits of wheat grass juice are found in its ability to promote the growth of new blood cells and its ability to soothe and rebuild the intestinal tract. Improve overall cellular metabolism and functioning. Aid in the absorption of water, minerals, and nutrients in the GI tract. Increase the body's own production of interferon, interleukins. Increase the number of antibody forming T-cells in the spleen. Help heal athletic injuries such as: muscle cramps, sprains, strains, bruises, swelling, soreness, tendonitis, and bursitis. Soothe and promote the healing of intestinal disorders such as: indigestion, heartburn, hyper-acidity, peptic and duodenal ulcers, colitis, and hemorrhoids. Promote the healing of kidney disorders. Kill parasites such as: pinworms and threadworms. Camu-camu is the single most concentrated source of Vitamin C found in nature, containing 30 to 60 times more vitamin C than an orange.64 Camu-camu also contains thiamin, riboflavin, and niacin and is rich in bioflavonoids. Years ago, bee pollen was "the" superfood in the alternative health industry -- and for good reason. But over time, it was replaced by the next "hot" thing and the next hot thing after that. The simple truth, though, is that pollen still ranks as probably the single greatest superfood ingredient yet discovered. Just because something is old doesn't make it out of date. When I hiked the 212 miles of the John Muir Trail a number of years ago, bee pollen was my primary energy food. It sustained me as I hiked a pass a day, ranging from 10,000 to 14,500 feet in altitude. Again, keep in mind that just because other superfoods have since come along (spirulina, chlorella, rice bran, noni, mangosteen, etc.) it doesn't lessen the value of the original great superfood. It's still number one. And, in fact, it has improved with age. Back when I first used it, it was available only in the form of fresh bee pollen. Flower pollen extract, though, which wasn't even possible until advanced manufacturing methods were invented, is a much, much more powerful supplement than the original. Its first advantage is that unlike bee pollen, flower pollen is remarkably clean (containing no bee parts or dirt) and is therefore close to allergy free. It is also far more digestible. It is harvested directly from the flower, totally bypassing the bees. In addition, unlike bee pollen, which contains the whole pollen grain, Cerniton Graminex is an extract of the actual nutritive heart of the pollen -- eliminating the hard to digest and allergy causing outer pollen husk. Graminex flower pollen extract contains virtually every single known compound necessary for life, including: vitamins, amino acids, nucleic acids, minerals, long chain alcohols, unsaturated fatty acids, prostaglandin precursors, and plant hormones -- not to mention several thousand enzymes. This is a remarkable superfood ingredient. It protects the eyes76 and skin77 from UV A and B damage by quenching singlet and triplet oxygen. Incidentally, 5 mg may not sound like a lot, but it's actually 125% of the standard daily dose. Astaxanthin is very potent. Consisting of aspergillus-derived enzymes and charged electrolytes, this blend is a "green food activator" that increases the bioavailability of any green food supplement by 12 to 49 percent. A question sure to come up is how this formula relates to the Accelerator™ meal replacement. And the answer is that although they share some ingredients in common, they have two entirely different purposes. Accelerator™ is specifically designed to provide sustained energy throughout the day and to support a weight-loss program by incorporating herbs that minimize the glycemic response. Private Reserve Superfood, on the other hand, was formulated to promote overall health and longevity. It was designed to be the ultimate superfood formula. And yes, the two can be used together -- either blended in the same smoothie, or as part of a weight-loss program that makes use of one large Accelerator™ shake a day, supported by a scoop of Superfood mixed in juice or a smoothie each day. Neochlorogenic and chlorogenic acid, 400 Carotenoids, Ellagitannins, Xanthones, Gamma mangostin, Preoexeronine, Acemannan, Cycloartenol, Cycloartanol, Cycloeucalenol, 24-Methylenecycloartanol, ß-Sitosterol, 24-Methylcholesterol, ß-Sitostenol, Stigmasterol, Stigmastenol, Campesterol, a-Tocopherol, ß-Tocopherol, g-Tocopherol, d-Tocopherol, a-Tocotrienol, ß-Tocotrienol, g-Tocotrienol, d-Tecotrienol, Furulic acid, a-Lipoic, Methyl ferulate, Coumaric acid, Sinapic acid, Isovitexin, a-Carotene, ß-Carotene, Lycopene, Lutein, Zeaxanthine, Proanthocyanidins, Campesterol, Stigmasterol, Avinasterol, Acylsterol glucoside, Oligoglycosyleterol, Monoglycosylsterol, and Methylsterol. As mentioned at the top of this report, the report itself references over 80 scientific studies in support of the ingredients used in the formula--and it could have easily been five times that many. And remember, every ingredient is present in meaningful amounts as supported by those studies. No pixie dust ingredients are used in this formula. This truly is an elite formula, and not everyone is looking for that. 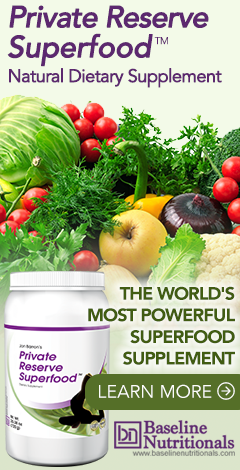 It is designed for those who want the best and the most powerful superfood that money can buy…who want what Kristen and I use in our daily health regimen. If that's what you're looking for, then you'll love Private Reserve. 61. Panda AK. "Tracing the historical prospective of Cordyceps sinensis --an aphrodisiac in Sikkim Himalya." Ind J Hist Sci. 2010;45:189--98. 70. Malmsten CL, Lignell A. "Dietary supplementation with astaxanthin-rich algal meal improves strength endurance -- a double blind placebo controlled study on male students." Carotenoid Sci 2008;13:20-22. I have celiac disease and cannot touch barley or wheat. Is there a supplement/ drink that you carry with all or most of these wonderful benefits without destroying my digestive system and therefore negating any good done by this supplement? The Foundation doesn’t actually carry any products, so we guess you’re referring to Jon’s formulas sold by others. All of his superfood formulas carry some form of barley or wheat based products. If you’re looking for superfoods that do not contain wheat or barley, then you probably want to look at the single cell greens such as chlorella and/or spirulina. Then again, people who have allergies to sea foods may have a problem with those. jon is the best. but there is a contradiction in this super food article if you say on the one hand that you never use "pixxy dust" and then list the last 3 ingredients at less than 5 mg . but as i said jon is the best. of course i havn't looked at the price yet ! Ahh! But those are proper levels for those ingredients—not pixie dust. I would like to buy the two, superfood and wt loss powders. The Baseline of Health Foundation does not sell product, merely provides natural health information. If you go to the products page, you can see all the formulas Jon Barron recommends and the companies that sell them. It sounds like what you are looking for is at Baseline Nutritionals. Hello I would like to ask you for your opinion about brewer's yeast, in my view, is one of the superfoods. 50% full amino acid proteins and high vitamins and some minerals .... how do you see it? There is no danger, in regards of quality or other possible risk during consumption (quantity), ig.promote candida etc. Yes, but with the caution. Truth be told, virtually all of the superfoods have similar problems because of their high protein content. Spirulina and chlorella, for example, are no exception. Proteins are what trigger antigens, not carbs or fats. The problem is that brewer’s yeast is higher on the list than most, up there with dairy and soy. I need your advise on omega 6 & 9. Just use our search field for articles or download Jon's book for free, he has a whole chapter on it! Appreciate your articles. I need to up my calcium levels and would prefer to do this through food intake rather than supplementation. I read about molasses a long time ago and keep it in the cupboard. Is this ok and is there anything else I could be taking, apart from greens (broccoli etc) as I understand they can interfere with thyroid function which I am cautious about. I'm concerned that this product is gluten free, as I have tested positive for the gluten gene. Also, what is the possibility of a food sensitivity, as there are so many different ingredients in your formula? Thank-you for you attention to this inquiry. The superfood formula described above contains less than 1/100 g gluten per serving from barley and wheat, which means that It is low gluten but not gluten free. Love your work Jon, but do you have to constantly tease us Aussie's with products we can't have?! We feel your pain. Baseline Nutritionals actually ships many of Jon’s formulas to Australia. Unfortunately, the superfood is not one of them. Australian customs did not consistently clear it (different customs agents treated it differently)—and when they didn’t, they simply threw it out. They are two different compounds—not related in any way. An allergy to one gives no indication as to how you will respond to the other. I read your book, which I ordered with an other one in the internet, it is really unbelievable what to read there. I changed my whole food to natural stuff, but have to clean my bowel y liver. The problem that we can´t buy this supplements here and the price for more than 250$ for cleaning all no is possible to pay because of the situation we have here in Venezuela it´s the amount of money most of us earn in 9 month. After reading your book I think, that it was an error to start with the liver but how can I do a cleaning of my bowel with natural cilantro an other herbs I can buy? P.S. Thank you for your answer, I hope with this I can help a lot of friends and people with big healthproblems. w as diagnosed with diabetes 21 years ago.I've since been told that I have fatty liver I'd like to know exactly what steps I can take to help heal my liver and reverse diabetes starting with some type of cleanse and healthy foods to maintain healthy organs. Read Jon's book and make sure to check out the link at the top that says "How To Detox"
When I tried bee pollen, I immediately had a severe migraine. Do you think it would be safe to try flower pollen for the reasons you indicated? And do I just find it at a health food store? Do I take it in tincture form or in the form of pills. Thank you for sharing your most informative knowledge with us for free. If you’re looking for just flower pollen, Graminex Pollen-Aid is a good brand. As for allergies, yes, flower pollen is much cleaner than bee pollen and much less likely to produce allergies. However, it depends on what you’re allergic too. It also can depend on what plants the pollen is coming from. For example, pollen gathered from ragweed plants would be more likely to produce an allergic response than pollen gathered from avocado trees. That said, you can buy some flower pollen and then start by taking just a quarter of a capsule. Depending on your response you can pick it up to half, three-quarters, and then a full capsule. Listen to your body. This may be a stupid question but; if you are taking the superfoods do you need still need to supplement fiber and Omega 3? My second question is; is there someone I can talk to and have look over my daily supplements and let me know if there is anything else I need or of I am in fat taking more then needed? As Jon points out, the formula he describes above is not a replacement for supplements. Each scoop, however, does contain 25% of your daily fiber requirement. Depending on how you eat it, that number can climb significantly. For example, if you blend it up with some juice and frozen berries, the berries will add fiber content. And no, there is no one at the Foundation that can work one on one with people. We receive upwards of 10,000 comments, questions, and requests from subscribers every month. One on one consultation is simply a physical and logistical impossibility. We need to get my husbands cholesterol down. Which of your supplements would be best to add to our daily green drinks? We sent this question to Baseline Nutritionals, who sells products. Thanks!